You get two for the price of one at John Moore Bar in Weston. Not on the drinks, sadly – though they’ll hardly break the bank – but on the place itself, which has exactly the kind of split personality you’d want from a rum shop. 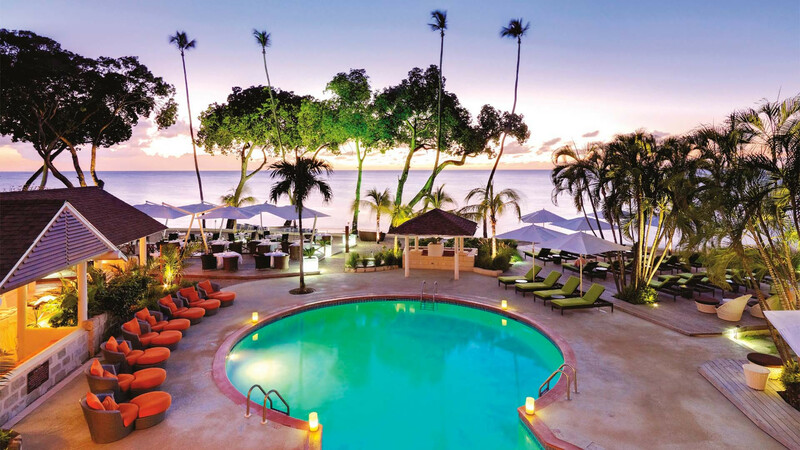 The front of the bar sits metres from the narrow, potholed highway that runs up the northwest coast of Barbados from Holetown to Speightstown, its brightly painted façade – emblazoned with branding for Mount Gay Rum – drawing in thirsty punters to the long copper bar like a tractor beam. The back, however, might as well be on a different planet – let alone facing in a different direction. Open to the elements and jacked up on breezeblocks above pure white sand, it looks out over the kind of beach you’ve seen in pictures and dismissed straight away as Photoshopped to an inch of its life. The sea’s too clear and blue, the sky has a light but uniform dusting of clouds that can’t possibly be genuine, and there’s absolutely no way that bright blue fishing boat was ever on that beach. Except it was, it’s all real, and there’s a bar right next to it. So, with that in mind, you’ll get some idea of how they roll in this part of the world when I tell you the front of John Moore Bar – with its tarmac views, soundtrack of grumbling traffic and immediate access to beer and rum – was packed, while the beach-view tables were empty. 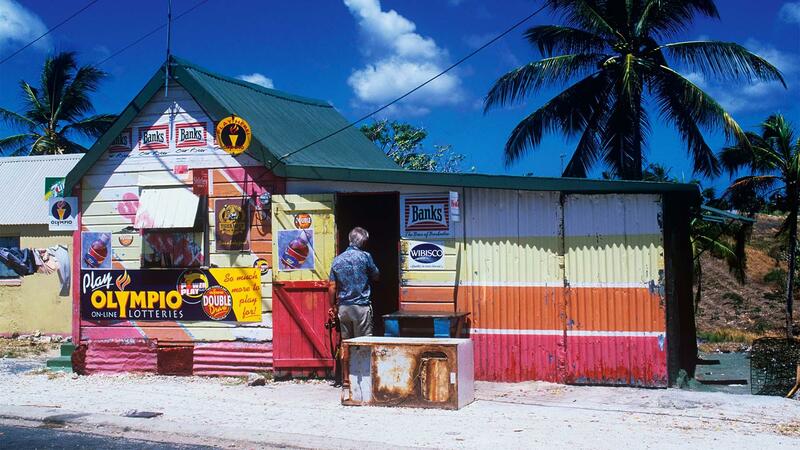 There are, I’m told by a reliable source, more than 1,800 rum shops on Barbados. Given it has a total area of just 431km² and a population of 284,644, that’s more than four rum shops per square kilometre and one for every 150-odd people. To put things into perspective, the UK has 225 times more people and is 565 times bigger, yet only has 29 times as many pubs (52,750, since you ask – and that number’s falling). They don’t all have beaches for gardens like John Moore Bar, but they do mostly adhere to a tried-and-tested formula of simple, shack-like construction, bright exteriors (often in the colours of alcohol brands or phone networks) and a scattering of tables filled with loudly chattering locals drinking rum or beer. 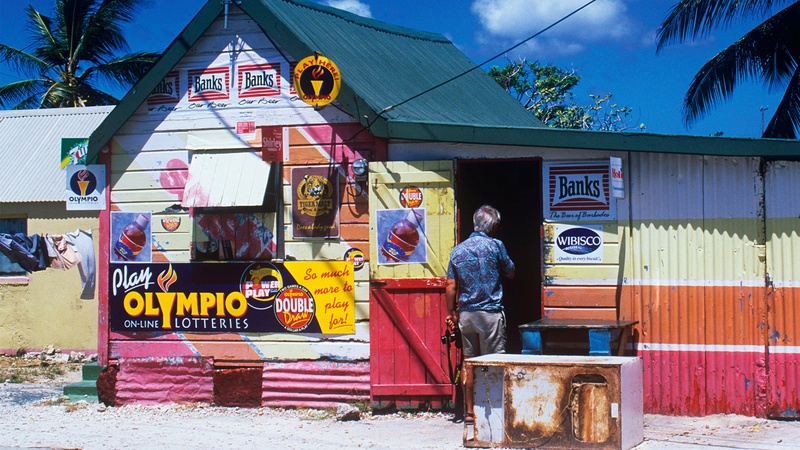 Put simply, if you want to know anything about Barbados and its inhabitants, you need to know about its rum shops – and you need to know about rum. Though its claim isn’t totally without contention (ask a Brazilian), Barbados is generally thought to be the birthplace of rum. Sugar cane was introduced to the island in the 1630s by British colonialists, who deforested the land and imported slaves from Africa to provide forced labour, as Barbados grew to become a sugar-producing powerhouse. The unwanted byproducts of extracting sugar from sugar-cane – including molasses and ‘skimmings’ – were often dumped in the ocean, until planters realised they would ferment to create a sweet, alcoholic drink. Though it was given the early, somewhat ominous, name of ‘kill devil’, this rough and fiery drink would eventually become known as rumbullion, which was then shortened to rum. In 1703, Mount Gay was born when the ironically named John Sobers inherited a distillery and asked his friend Sir John Gay to run it. Though the distillery is in the north of the island, and the molasses used to make it are imported (the island’s focus is tourism rather than sugar production these days), the Mount Gay visitor centre, where I meet Darrio for a tour, is off the Spring Garden Highway on the outskirts of the capital, Bridgetown, in the south west. The tour begins, obviously, with a rum punch (it’s 9.30am), and ends on a platform over the warehouse where bottling and packaging takes place. The pace on the production line is slow and unhurried, and sweet, burnt-toffee notes from the rum mingle in the air with the smell of cardboard boxes and the clinking of bottles. The quiet efficiency in the bottling room is deceptive. Or, to put it another way, if you weren’t already aware of the importance of the stuff to Barbadians, you wouldn’t necessarily think anything remarkable was going on. But this – and the 50,000 American white-oak barrels that once held bourbon and are now filled with maturing Mount Gay rum – is a very literal source of national pride. Instead, the places where islanders go to pay tribute to the spirit their predecessors created are the rum shops, and as I discover as I travel around the island visiting them, they themselves are a distillation of the island’s people – laid-back, totally charming and welcoming to anyone and everyone. My wife and I have barely walked through the door of John Moore Bar before a couple of locals have freed up chairs and put drinks in front of us before we’ve even sat down. We’re soon being enthusiastically questioned about where we’re from and – of most interest to them – what I could possibly have done to deserve being the designated driver, and therefore unable to down eye-poppingly strong rum punch. “You’ll have to have beer instead,” they decide. 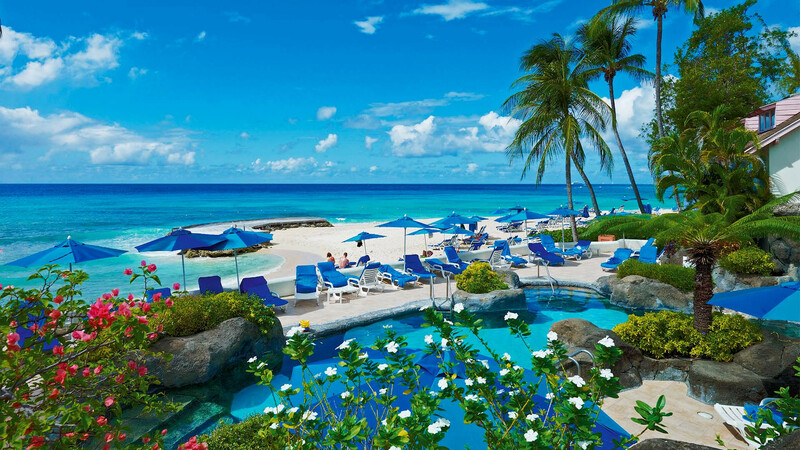 Our base in Barbados is in the west of the island, often known as the Platinum Coast, owing to the twinkling stretches of sand and silver-blue seas that are clear and calm. Running from just north of Bridgetown in the south to Speightstown (pronounced ‘Spikestown’) in the north, it’s where you’ll find most of the island’s most desirable resorts, including the two we stay in – Crystal Cove and Tamarind – both of which sit on impossibly beautiful beaches where tall palms and leafy manchineel trees provide shady spots on the sand. As it turns out, we’ve lucked upon just about the best place to position ourselves, not just because it’s pure catnip for beach lovers like us, but because it’s easy to travel to just about anywhere else. Barbados – the most easterly island in the Caribbean Sea – has a distorted-kidney-bean shape, with most of the resorts clustered around the south and west of the island. To serve these, and the capital Bridgetown on the south-west corner, the main highway runs like a coronary artery from Grantley Adams airport in the centre of the south, around Bridgetown and up the west coast. A dense network of small roads fans out from it, covering the quiet interior and wind- and Atlantic-battered (and savagely pretty) east. This means you can be watching a group of old men playing dominoes and talking politics in a rum shop in Holetown (just a few minutes up the coast from our hotels) one minute, and lying on a totally empty beach in the far south-east of the island less than an hour later. We spend most of our week on the island doing just that – mixing beaches, rum shops, restaurants and more beaches, with a good bit of island exploration thrown in. A number of drives take us out through the sparse and green centre of the island, where we stop off at Earthworks Pottery in the parish of St Thomas to check the out brightly decorated handmade ceramics. Just down the road are the Flower Forest botanical gardens – go there for views of the Atlantic through soaring palms and a mug of numbing bay-leaf tea – and Welchman Hall Gully, which offers a fascinating glimpse of what Barbados’s vegetation would have looked like before colonialists tore it down to make way for sugar cane. You won’t find much of that on the island anymore, but the faithfully preserved plantation house at St Nicholas Abbey has fields of the stuff, which is cultivated and used to make delicious (and pricey) rum. The tiny scale means you can see everything within a small area – from sugar being extracted from cane by the gnashing teeth of an ancient steam-driven machine to distillation, barrelling and bottling. 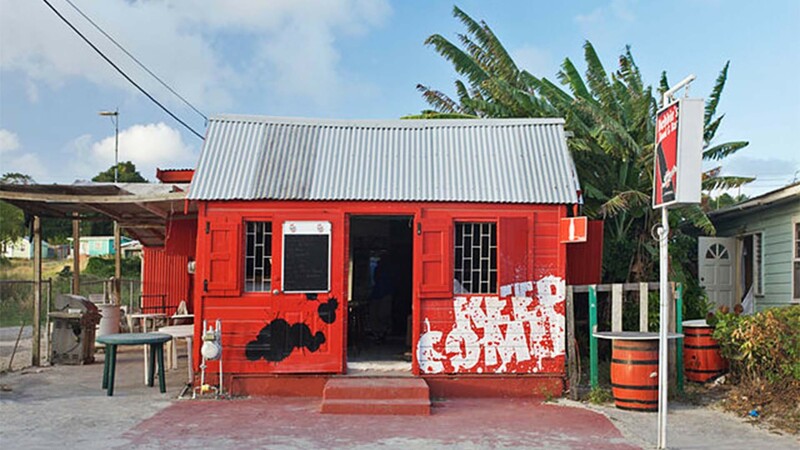 One of Barbados’s best-known rum shops, with blockbuster ocean views and a friendly welcome. One of the island’s best rum punches. 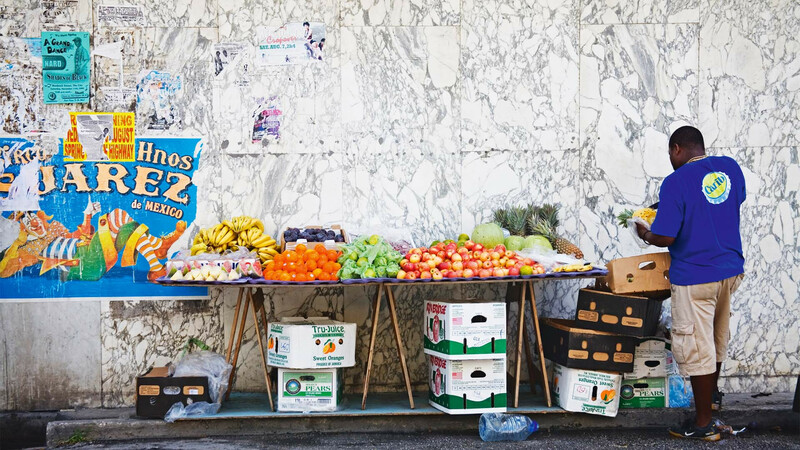 Tucked away on a quiet side street, away from the boutiques. Grab a seat outside and wave at the passing traffic as they honk their horns. Yes, that's Nigel Benn. And yes, it is run by his aunty. Swing by for a drink on the way back from the nearby Morgan Lewis windmill. Right opposite the Friday night fish fry action in Oistins, when it’s busy, bustling and a great place for a post-meal rum or beer. Conveniently located at a crossroad just outside Welchman Hall Gully. If you can’t spot it, you’ll hear it from the loud calypso blaring out. It’s also worth a trip to that remote east coast – take an excellent Island Safari if you don’t have your own wheels – where wild and beautiful beaches are lashed by waves that only those with surfboards bother to brave, and perhaps the impressive of all these is Bottom Bay, in the extreme south east. Leaving the airport behind us, we pass through small towns packed with chattel houses, rum shops and churches (which are almost as ubiquitous as those temples to the island’s favourite spirit), and cross over from the parish of Christ Church to Saint Philip. Told to look out for a signed turnoff on our right, we pass dusty road after dusty road (“Is this it? This one? How can it not be this one?”) and are about to give up when we spot a well-hidden sign and drive down a short road that appears to end when it runs off the edge of the cliff. We’re about to do exactly that when a figure in the distance starts wildly waving his arms in the air in a way that even a non-Barbadian could tell means ‘whatever you idiots are about to do, don’t do it’. He gestures, grinning widely, to patch of gravel where he’s standing and directs us into what we soon realise is a kind of makeshift car park. Within about 30 seconds, we’re stood holding the green coconuts topped up with rum he’s just sold us, while he explains the geography of the area and recounts stories of his prowess on the cricket pitch. “I’m an all-rounder,” he tells us. No kidding. He directs us through a narrow gap in the tumbling foliage, and we spill out – still juggling our enormous coconuts – onto ice-white sand framed by jagged cliffs and tall palms, while sea that’s so blue you’d swear they dye it, whipped up into fierce frosty peaks, lashes against the beach. It’s one of the most breathtaking beaches I’ve ever seen, and the largely deserted setting is utterly primitive and unmanicured. 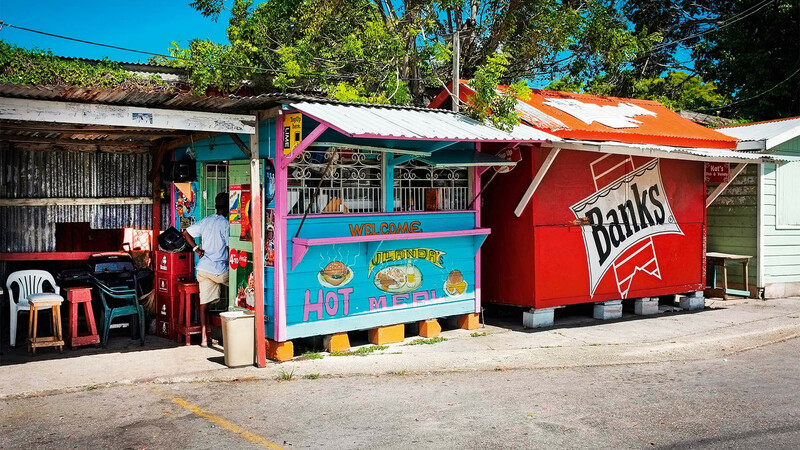 Back on the road – and some sort of reality – we head west to the small south-coast fishing town of Oistins where, it being Friday night, what seems like the entire planet has made a pilgrimage to the dozens of grill and rum shacks that pitch up between the coastal road and the sea. Queues of locals and tourists stream out of the most popular ‘restaurants’ (try Pat’s Place), and the smell of barbecued fish and the din of loud music and people fill the air. There’s a particularly dense crowd around one of the shacks, the Oistins Academy, where male-heavy groups are going head-to-head in the fiercest game of dominoes I’ve ever seen – a chalkboard nearby, scrawled with an incomprehensible (to me at least) set of rules, advertises it as the ‘Bragging Rights’ tournament. There’s even an afterparty, just in case you fancy something lower-key than liming and grinding on the strip’s main stage to booming calypso. Though we’re smack-bang in the middle of the island’s tourist hub, nothing feels forced or put-on – it’s just there, happening, and we’re just being absorbed into it. We get the same feeling everywhere we go on the island, and we get it again the following morning as we wander along the strip of beach just north of our hotel and spot a turtle bobbing around in the waves. There are people on the sand and in the sea, but no one seems to notice the interloper – it’s just part of the island’s extraordinary furniture, like the beaches and people and rum. And it’s the latter that provides the heartbeat. “Rum’s in our veins,” Darrio tells me. “This is its birthplace, so when Barbadian people talk about it they’re not just talking about a drink. You could say it’s the spirit the country was built on.” And if you’re looking for proof, head north on the highway to John Moore Bar, order a rum punch and pull up a stool – you’ll see the foundations are strong and deep, and they taste pretty damn good, too.